One thought I had at the beginning of the year was to go through my little pile of quilt tops once in a while and see if I could change or add something extra, anything really that rekindled my interest enough to get the quilt back on track and finished. So this week I'm relooking at a WiP from May last year and having another play with this star quilt top. Sometimes it is good to leave things, have a break, and then come back to it... it's all part of the design process, yes? I used Victoria Findlay Wolfe's 'mostly manor' fabrics for this star quilt. After finally settling on a layout, once it was all together, it always felt just a bit too small to be very useful. I've been wanting to use that gold & white fractured stripe in something... wonder why it took me so long? Oh, it looks grand! That wide yellow is perfect. (How wide is it?) I agree that it's good to let quilts rest for a bit, especially if we're stumped with the next step. It seems like that time away gives us fresh eyes when we look at it again. These two borders were just what it needed. 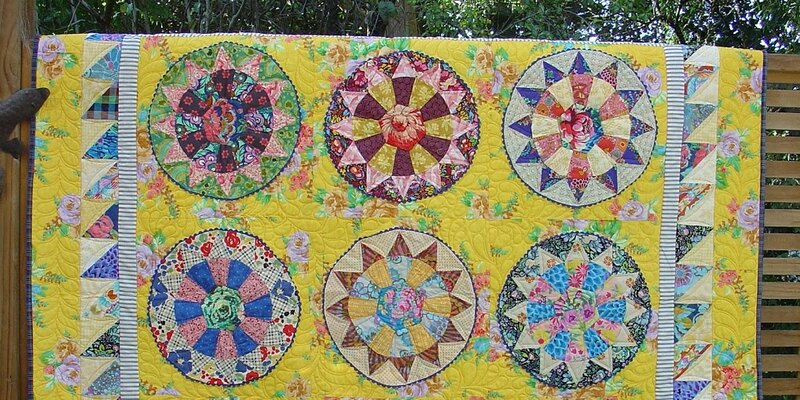 What a wonderfully bright and happy quilt! Ooh, that's lovely! So bright and cheery. Yummy. The stripe adds so much to this quilt. I think borders are overlooked these days. Hopefully your lovely top will encourage more people to consider one. This is so bright and happy! You did a great job! Love it!! What a fun sunny quilt top!! Yes, the yellow floral is just right! Beautiful job Linda. I love the stars and your two borders set them off so well. The yellow fabric is gorgeous. 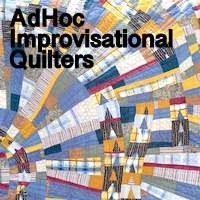 A lovely quilt top -looking forward to seeing how you quilt it. Oh, there it is - perfect! That border is cheery and bright and just the thing to set off all those gorgeous stars. Definitely worth the wait. Both borders really finish off the quilt nicely. Congrats on a gorgeous finished flimsy. Those borders finish it beautifully! Will you use the fractured stripe to bind it with too?